It is best to design a plantscape based on the interior and traffic of the office as well as individual desires. Usually, an office will have mixed sizes, some tall and some small. A roughly 3,000 sq foot office will use about 10-15 plants, with the lease rate typically ranging from $140-$500 per month including guaranteed maintenance. With 20 years experience we emphasize proper plantscape design. We set up the plants with not only beauty and subtle style but practicable and efficient maintenance in mind. We take pride in our plantscapes and our value. 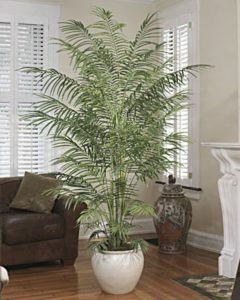 We use high quality, heavy ceramic containers up to 24″ in diameter with matching glazed under-saucers and invisible feet to avoid carpet crush under the large floor plants while providing safety and weight to the tall trees. We look forward to hearing from you and your ideas. Qualified horticultural technicians help us ensure a continually appealing work environment by providing all your plant maintenance needs. We offer a less intrusive, more economical maintenance model with our proven fail safe maintenance systems. Efficient, time-tested biweekly maintenance will work for 100% of all interiorscapes. We guarantee it. If any plant declines we promptly replace it. Contact us today for pricing!